Anyone who does any sort of research-based writing knows how easy it is for an occasional close approximation of another’s prose to slip into a summary. Such instances rarely constitute plagiarism, but they can occupy an uncomfortable gray area. Recent allegations against Slovenian theorist Slavoj Žižek, however, charge the wholesale theft of entire passages of text, almost verbatim. It’s an unusual story, not least because of the source material Žižek allegedly lifted—an article in American Renaissance, identified by the Southern Poverty Law Center as a white supremacist publication. As Critical Theory reports, the first hints of a possible borrowing came on July 8 from Steve Sailer, writing for the The Unz Review (an alternative outlet with its own sometimes peculiar preoccupations when it comes to race). Sailer points to a portion of Žižek's 2006 article “A Plea for a Return to Différance (with a Minor Pro Domo Sua)” that is uncharacteristically lucid and, well, un-Žižek-like. The text in question summarizes Kevin MacDonald’s anti-Semitic evolutionary-psychology book The Culture of Critique. The day after Sailer's observation, blogger Deogolwulf tracked down a review of the MacDonald book by Stanley Hornbeck in American Renaissance and placed Žižek and Hornbeck’s prose side by side. Observe the significant similarities and minor differences here. With regard to the recent accusations about my plagiarism, here is what happened. When I was writing the text on Derrida which contains the problematic passages, a friend told me about Kevin Macdonald’s theories, and I asked him to send me a brief resume. The friend send [sic] it to me, assuring me that I can use it freely since it merely resumes another’s line of thought. Consequently, I did just that – and I sincerely apologize for not knowing that my friend’s resume was largely borrowed from Stanley Hornbeck’s review of Macdonald’s book. It is true that unlike, say, Senator Rand Paul—who apparently passed off almost wholly plagiarized articles as his own original work—Žižek does not take any credit for MacDonald’s ideas and summarizes them only in an attempt to refute them. Nonetheless, as Newsweek notes (in an unfortunate choice of words), for conservative critics, Žižek is “a big scalp” and the matter a very serious one. Zizek’s “sloppy citations,” writes Critical Theory, have come under fire before—notably in his feud with Noam Chomsky, who caught Žižek misattributing a racist quote to him. (Žižek “admitted the mistake and apologized.”) This case seems much more severe for the length of the passages lifted as well as Žižek's failure to check and cite his source. Charges of academic plagiarism frequently go to press. But with such a public figure (and film star) as the flamboyant Marxist Žižek, and such inflammatory far right source material, this particularly regrettable incident---unintentional as it may be---makes for some particularly sensationalist headlines. This would have been an enjoyable article except for the gratuitous Rand snark. One of the nice features of Open Culture is that it generally avoids current political references. Hopefully this type of remark is just an aberration that will not be repeated in future posts. Why do does this website keeps featuring this guy? CEH – Agree. Since snarky comments like that invite others to remind us that our very own Vice President has been judged guilty of plagiarism in his dark past. Let’s hope no one does that. Since there is nothing new to write about marx or marxism and copying each other’s work is a pastime among such ‘intellectuals’ who is really surprised at palgiarism exposed? Zizek is and remains a fraud. The only thing communists create with any real efficiency is corpses. Bobby Boy and CEH in NJ, the bottom two remarks are reason enough to criticise someone when they’re worth criticising (as Paul most definitely is) – while the left is hamstrung by well-meaning liberals not wanting to cause offence to anyone, the right will happily libel people (as both Joe and Jason have done) and we’ll have…well, the world we have now, only worse. Openculture ought to be political, as the right would absolutely love to have sites like this shut down. 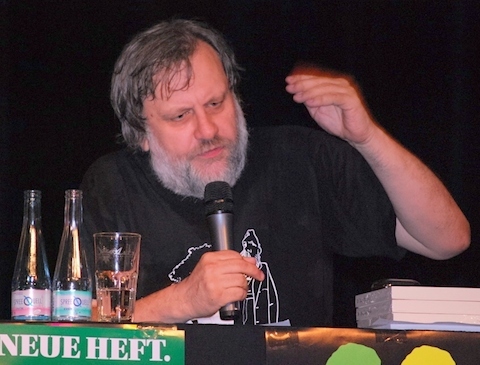 Droy, I looked back in the archive, and I see that we had two other posts on Zizek in 2014. Not exactly overkill. CEH in NJ, do you really think it’s appropriate to tell a site what it can and can’t talk about? Basically what you’re saying is write about ideas, but only ideas I agree with. Kind of narrow-minded … and certainly presumptuous, I must say. I fail to see how a valid comparison with another high-profile, well-documented plagiarism case in an article about possible high-profile plagiarism constitutes “gratuitous snark.” Nor is it necessarily a political point in any way, since I have absolutely nothing to say above about Senator Paul’s politics.